UKIP members in north Wales have called for the party's regional AM to be deselected. They claim Michelle Brown is "abrasive and discourteous" to local members. Shaun Owen, secretary of UKIP's Delyn branch, has written to the party's National Executive Committee (NEC) asking for action against her. UKIP dismissed the letter as written by a "tiny and insignificant group" holding a "long-standing grudge" against Ms Brown. In the letter to the NEC, Mr Owen said a motion, agreed at a meeting of UKIP's north Wales branches on 8 July, called for her removal. It read: "That the north Wales branches call on head office to deselect/remove Ms Brown as our UKIP representative both at the local level and as our representative in the Welsh Assembly." 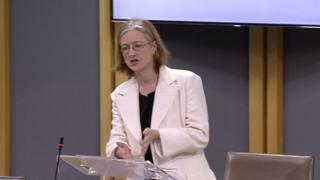 He stated UKIP's Wales MEP Nathan Gill, who now sits as an independent AM, was also at the meeting. Mr Owen said: "For some time we have been appalled by the abrasive and discourteous manner of Ms Brown towards UKIP locally. "Her lack of effort in pursuing the aims of the party both locally and nationally is of concern to members across the region." He added he believed members would stop supporting UKIP if Michelle Brown remained in the role. In an email to members sent on Wednesday, seen by BBC Wales, Mr Owen said the NEC had not responded. A spokesman for the UKIP assembly group said: "The meeting the letter describes was not authorised by UKIP Wales and holds no constitutional significance in the party. "This letter and the 'leak' to the media was made by a tiny and insignificant group of individuals who hold a long-standing grudge against Michelle Brown." Under assembly rules, UKIP would not be able to "remove" Ms Brown as a north Wales AM. If it did decide to expel her from the UKIP group she would continue to serve as the North Wales AM but as an independent rather than under the UKIP banner. In February, Ms Brown denied an allegation she had smoked recreational drugs in a hotel room. And she said she had acted "with propriety" after it was revealed she had discussed how an advert for a job in her office could be changed to help her brother get an interview for the post.